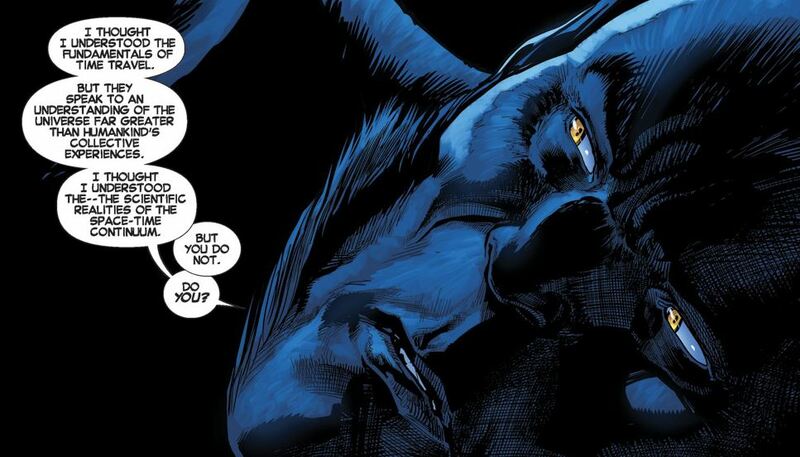 The Critical Angle: Why is Beast so awful? – AiPT! That big brain just can’t bypass his biases. In tomorrow’s Astonishing X-Men #13, Havok begins his road to heroic redemption, thanks to new series writer Matthew Rosenberg. Maybe he can do the same for another of the series’ stars, Beast. What? You don’t see Beast as a villain? He certainly doesn’t, either. That’s despite the fact he has, in the past, used Nightcrawler’s funeral as an excuse to berate Cyclops, joined up with a secret society to make the world’s decisions for them and, most egregiously, disrupted the entire timestream to bring teenage versions of the original five X-Men to the present. It’s that last one that even made the cosmic entities of the Marvel Universe take notice, as Uatu the Watcher spent an entire issue chastising the “good” doctor Hank McCoy in Brian Michael Bendis’ All-New X-Men #25. Can we use what’s there to figure out why the formerly bubbly Beast thinks he can do these things, without consequences? At the heart of it, Beast is a victim of the infamous Dunning-Kruger effect — when a person overestimates their knowledge or expertise in a certain area. A little bit of knowledge can be a dangerous thing, if you think you actually know it all. It’s a real-life phenomenon made worse in the Marvel Universe, because there any “scientist” really does know everything; specialization of fields really doesn’t exist. So on the comic page, it’s not so strange to expect a biochemist to also know the ins and outs of time travel. Even though it’s different in the real world, it’s still very easy for the intellectually gifted to think, of course, they’d be equally proficient in everything. It’s why smart people are some of the biggest suckers. Not only do they fool themselves, but they leave themselves open to be taken by grifters, as psychologist Maria Konnikova describes in her book The Confidence Game, which details some of the greatest scams ever — including how even Al Capone was swindled. (And if there’s any doubt Konnikova knows what she’s talking about, consider how she used others’ overconfidence to win a major poker tournament, despite being a complete amateur). “Smart people are very good at rationalizing things they came to believe for non-smart reasons,” Skeptic magazine publisher Michael Shermer is fond of saying. If someone else had said the above, Beast would probably be able to see that correlation doesn’t necessarily mean causation, and of course you should consider the consequences of an action before following through. But Hank is too smart to see the flaws in his own thinking, just like highly educated conservatives are actually more likely to deny climate change. Joining the Illuminati only compounded that overconfidence. Social groups are really good at enforcing norms, and punishing deviation. If to be part of the club you have to believe you’re smarter than everyone else, and you know just what to do in every situation, to question that is to risk expulsion. Accepting your own superiority becomes part of the group identity. And even if some lingering doubt crept into Beast’s brain, it would likely be overcome by cognitive dissonance. The Watcher patiently explained to him — showed him, even — that nothing good would come from his timey-wimey actions, but what if Beast actually owned up to it? Then he’d also have to realize he spent so much time and effort being wrong, and he’s responsible for all the bad to come from it. It’s a lot easier to find a reason the other guy’s wrong than it is to accept that. It would be nice to think that being aware of how thinking gets tripped up makes it easier to spot our own biases, but it’s simply not true. And the smarter you are, often the worse it is. So Beast isn’t bad, he’s just wired that way. Uatu takes a dimmer view. The Critical Angle is a recurring feature that uses critical thinking and skepticism to analyze pop culture phenomena. Skepticism is an approach to evaluating claims that emphasizes evidence and applies the tools of science. Rather than repeating the same old assertions, we put them to the test. Special thanks to the awesome denizens of the CBR X-Men forum for pointing this issue out, including AcesX1X, Huntsman Spider and PsychoEFrost.